The highly anticipated launch of the EOS.IO blockchain is less than one month away. EOS.IO will feature a Delegated Proof of Stake (DPoS) consensus mechanism, joining the ranks of other publicly available blockchains, such as Steem, BitShares, and Ark. Users in DPoS systems vote for a group of delegates, who are the trusted parties responsible for maintaining the network. As with any election, there is a heated competition among those who are vying to become one of the EOS.IO delegates, called Block Producers. Block producers (BPs) are one of the key innovations introduced by Block.one, and they will be the decentralized entities governing the EOS.IO blockchain. Instead of being run by a small number of mining pools, EOS.IO will have a constantly changing group of 21 Block Producers. This isn’t necessarily the “decentralized dream” of millions of independent nodes, but it moves us at least 2x closer to making it a reality. Block Producers will create the blocks of the EOS.IO blockchain, which could potentially lead to huge incentives. BPs will earn block rewards in the form of EOS tokens produced by token inflation. According to the release of EOS Dawn 4.0 only 1% of the tokens produced through inflation will be paid to block producers out of the 5% of total inflation each year. If EOS is worth $20, then an average block producer could be making $7MM in net revenue (this is based on a lot of assumptions). EOS BPs will be incentivized to re-invest their rewards. For instance, they may reinvest into infrastructure growth, community support and education, and financial support for development of EOS DApps. How many EOS Block Producer Candidates are there? 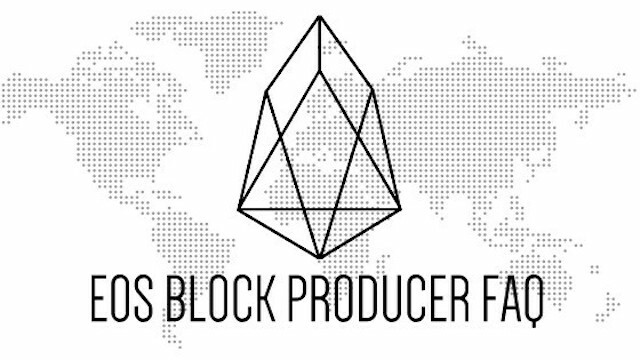 As of May 2, 2018 — there were 104 EOS Block Producer Candidates. What are some best practices for being an EOS Block Producer? Anyone can announce candidacy to be a Block Producer. EOSGO , an independent and community-based organization that is a self-proclaimed bridge between Block.one and EOS community/token holders, has outlined it’s own eight criteria below which have been commonly accepted by the community, but are not officially requirements to be a Block Producer. A public website URL and at least one social media account. Relevant background qualifications for at least 67% of staff. Estimate of technical specifications and total expenditure for resources by June 3, 2018 — posted to Steem blockchain. Check mark given for any estimate, modesty encouraged by permanent Steem record. Quality and accuracy of effort will be judged by the EOS community. Estimated scaling plan for hardware after June 3, 2018 — posted to Steem blockchain. Rough outlines receive a check mark, open review gauges the effort. Community benefit project outline, only for projects expected to be public by June 3, 2018 — posted to Steem blockchain. Listing of Telegram and Test-net node names for community testnet participation. Values, community project timeline, finances, transparency, or any other topic the candidate deems important. Please show the direction and future of your candidacy in a Steem post for the community. Each of these criteria have been designed by EOS GO to shed some light on how EOS Block Producers will be operating. How do EOS Block Producer elections work? Ongoing elections will begin on June 2 when the EOS mainnet goes live. The initial election period will end when 15% of the total 1 billion EOS tokens have voted (150 million). During the initial election period, 21 Appointed Block Producers (ABP) will be chosen at random from the pool of candidates. Once the election period ends, the ABPs will be replaced with the elected Block Producers. All of the EOS ERC-20 tokens will need to be registered first to be able to vote and be active on EOS’ blockchain. All registered tokens will be immediately staked 50% towards network bandwidth and 50% CPU for the duration of the election period. Each members’ staked tokens will count as individual votes towards each of the Block Producers they have chosen. For voting purposes, tokens will need to be staked towards CPU or Bandwidth (and not RAM). Members can also delegate (“proxy”) their voting power to others who can vote on their behalf. Proxied voters can outsource the decisions to trusted friends, exchanges, or community members. Each EOS member will get to choose 30 Block Producer candidates in their vote. Votes are weighted by the amount of tokens being staked, and the Block Producer candidates that receive the most votes will be those who will be currently producing blocks (and earning the rewards). Votes can be changed immediately, but staked tokens will be locked for 3 days after ending staking. Elections will be ongoing, votes will be recalculated approximately every 2 minutes — so, it’s possible that Block Producers will be changing as often as every few minutes. What criteria am I personally considering when voting for Block Producers? In addition to the criteria outlined by EOS GO, these are my criteria for casting my votes for Block Producers. 1) Transparent governance & clearly-written constitutions. I want to see really BPs with transparent governance models constitutions that are written well and easy to understand. Teams are important. I want to see teams that have a lot of experience running large datacenter infrastructure, security, and development. 3) Top-notch hardware — plenty of RAM, CPU, and Bandwidth. BP candidates who have clearly not spared any expense in building their initial infrastructure are in it for the long haul. Ideally, I want to see >24 cores and > 200GB RAM in each node, 10G switches, and 10G fiber uplinks. Additional bonuses are strong firewalls, reverse proxies, and georedundancy. Ideally, I want to see Block Producers get elected that are in diverse geopolitical locations. 5) Willingness to participate in 3rd party audits. 3rd party audits of security and infrastructure — perhaps even spending would be amazing. Block Producers have a responsibility to the community to be as transparent as possible. Sending a good chunk of earnings dedicated to DApp and community projects development would be smart. Since they technically should not be paying for votes, this is a good strategy to keep the community behind the BP. 7) Cooperation, but not collusion. Having intention to work together with other BPs from around the world in regard to technology hardware, software, security, and EOS blockchain standards is good. However, acting in collusion with other BPs to manipulate the EOS governance for your own gain is just not cool with me. This article has been modified and edited from a longer medium post.